The following is a step by step 12 part realistic portrait drawing tutorial created by Artist Andrew Fisher. This is a video lesson that I found on YouTube. It is a lesson on how to draw Rihanna step by step using pencil. In part 2, the Artist will demonstrate how he prepares his drawing at this stage, before adding tone. The first thing he does is to erase any guide lines he created in step 1 as these lines may show through the final drawing. He will also lighten any really dark lines. He also uses some masking tape to mask out the eyes. This will keep the white of the eyes clean and bright and create a nice contrast with the darks in the drawing. In part 3, the Artist will focus on skin tones and blending as the name of the video suggests. He starts by lightly covering the face with a nice even tone using a blunt “B” Pencil. He keeps his pencil blunt as he does not want any indentations in the paper. He then uses an ordinary tissue as his blending tool. Make sure the tissue paper is completely dry with no added lotions or liquids. At this point, we now have a nice uniform tone on the face. In this video, the Artist will demonstrate how to add light and dark tones to the face. In this step, he will be using a “2B” and “B” pencils. Using his photo again as a reference, he begins to gently add the darker tones to the face using the “2B” pencil and the tissue to blend. Now, the Artist is ready to start on the detailed work, specifically, the Mouth. He is using mechanical pencils for the detailed work. Mechanical pencils enable the artist to have more control and to draw much finer lines than with an ordinary pencil. In part 6, the Artist begins working on the Eyes. He first removes the masking tape. He is not doing any detailed work on the eyes at this point. He is only concerned with lightly plotting out the eye ball and general shape of the eye. Using mechanical pencils, the artist begins to detail the eyes. He makes the pupil very dark almost black while keeping the white of the eye as bright as possible for contrast. He uses a cotton swab for blending in the eye. The videos do not show it, but by this time, the artist has completed the ear and the dark lines around the eyes. At this point, the Artist takes a step back to observe his work and to figure out what may need some adjusting on the face. He indicates, that during the process of drawing, some of his work has been smudged, so he will have to go back later on and darken the darks and lighten the lights. He also demonstrates how to add the eyebrows and how to suggest a hairline. In step 9, the Artist is drawing in the shape of the hair. He uses the same measurement techniques to draw out the shape of the hair that he used to plot out the face from step 1. In step 10-12 the Artist will be working on the hair. The Artist admits that this is probably the most difficult part of the drawing and one that he finds least enjoyable. According to the Artist, hair takes a long time to complete and you end up using a lot of your resources. That being said, the hair is still a very important part of a realistic drawing. 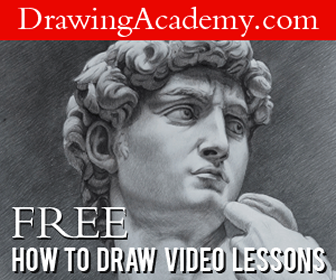 The Artist will provide lots of excellent tips and step by step techniques to help you complete the rest of the drawing. I would like to personally thank Artist Andrew Fisher for providing this free, in depth step by step realistic portrait drawing tutorial. If you would like to see more free videos like the ones above, please follow this link to visit Andrew’s YouTube Page. Please also take a moment to visit Andrew’s Website here where you can learn more about him, view his artwork and commission a portrait. Wow! this is incredible. Such a detailed video and tutorial. I was searching for such a post! Great tutorial, in your pencils, what is the density? I enjoy the videos, I have retired and started learning to draw.